Live Action News has previously detailed how the National Organization for Women’s (NOW) move toward abortion was actually influenced by pro-abortion men, and how, instead of advocating for all women born and unborn, NOW used its power to crush the opposing views of pro-life feminists. What is rarely discussed is how women who initially supported NOW’s agenda abandoned NOW over the very issue of abortion. According to an April 1973 report published in the Cedar Rapids Gazette, many NOW members resigned after the abortion resolution was adopted by NOW.”[I]n 1968, many members of the feminist action group, National Organization for Women, angrily resigned after the group endorsed repeal of all laws restricting abortion,” the paper stated. 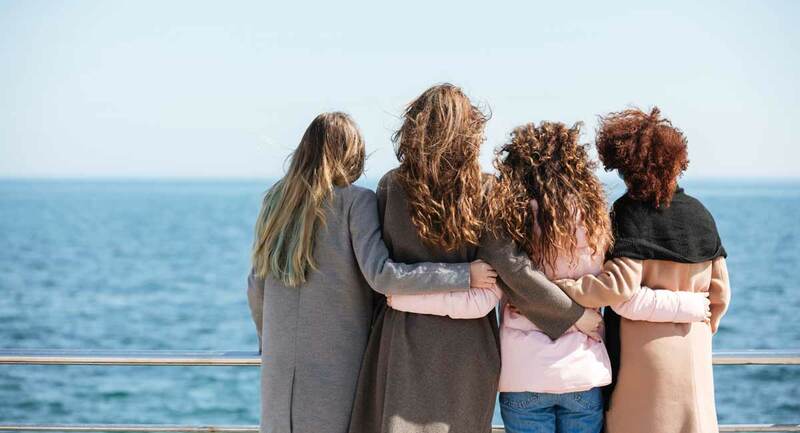 One of the original, longtime members of NOW, Elizabeth “Beth” Boyer, resigned after NOW, which claimed to promote the views of all women, passed the first pro-abortion resolution of any women’s group in the nation. In her book Subverted, author Sue Ellen Browder noted Boyer’s pro-life convictions drove her from NOW in 1967. “She knows the women she recruited to join NOW in Ohio would be as appalled at the abortion plank as she is. In Boyer’s words, a ‘new life is a sacred trust,'” wrote Browder. New York Times columnist Gail Collins described the split between Boyer and NOW, writing that Boyer resigned after “a ‘shouting match'” over abortion a year later and founded the Women’s Equity Action League (WEAL). WEAL, under Boyer’s leadership, was instrumental in the passage of the Equal Credit Opportunity Act of 1974, according to author Browder. WEAL also worked to abolish university quotas and discrimination against women. 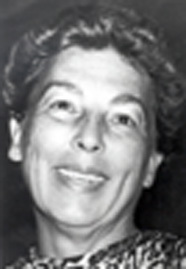 As a result, Boyer was one of the first women inducted into Ohio’s Women’s Hall of Fame. Boyer has been described as a “brilliant and influential American lawyer,” a “champion for gender equality in education and advocate in the passage of Title IX legislation,” as well as an author. In 1971, Mitchell merged her NOW chapter with the Cedar Rapids Women’s Caucus. 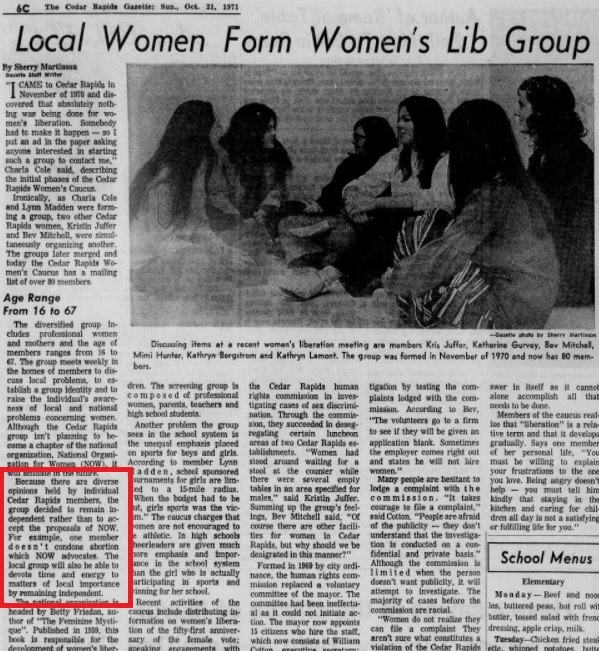 An October 31, 1971, report by the Cedar Rapids Gazette (pictured below) stated that it was NOW’s support of abortion that drove the decision to leave the organization. In 1967, Paige Palmer, NOW’s director of women’s activities, ended up walking out of NOW’s conference at the Mayflower Hotel where the abortion resolution was introduced. As NOW president Betty Friedan forced her male-initiated abortion resolution on members, Palmer warned conference attendees, “People will not join this organization if we adopt this resolution.” Rather than fighting for women’s rights, author Browder noted that Palmer observed that there was “a group who came only to see that the abortion question was discussed and passed.” Medical expert Dr. Shepherd Aaronson was also stated to have been “shut up in no uncertain terms,” while women with no medical knowledge were allowed to speak in favor of abortion. In part two, we will show that even ten years later, women still loudly opposed the move towards abortion ‘rights’ through the National Organization for Women.